B&H PhotoVideo is an online e-commerce websites with a physical presence in New York. They have been in the business of selling photo and video equipment since 1973. Although I live in India, I have been a happy customer of B&H since 2013. Over the years, I have purchased photography gear worth several lakhs from them. I generally request someone traveling to India to carry my orders. In all these years of shopping purchasing remotely from them, I have never had a problem. My packages have always arrived when they were supposed to. I don’t have that confidence with any Indian e-commerce website yet. But things did not go right with the latest order that I made this month. The mistake was mine – I ordered archival paper of the wrong size. I needed 13×19″ sized paper but I incorrectly ordered 17×22″. The ease of shopping online is only as good as the ease of returns. B&H has a simple 3o-day return window. They have a 3 step process for returns. I just had to request an RMA for the product that I no longer needed and ship it back to them. They require you to pay for return shipping. I was fine with that because the mistake was mine. But how would I to ship it back? My contact in the US was staying in a hotel and did not have the time to visit a post office. The product was 17×22″ and not easy to carry around. It was certainly going to be a bother to have someone coordinate returns. Nevertheless, I wrote to B&H and waited for an RMA authorisation. Meanwhile, I started looking up USPS and UPS for mail pick up options. I knew this service existed, but I had never used it before. From Wikipedia, “United States Postal Service is an independent agency of the United States federal government responsible for providing postal service in the United States.” I presumed that they would have the best rates and coverage. Easy to sign up. Could provide my Indian address for signing up. Confusing mail pick up options. Their website had a different page for Click-N-Ship® and Schedule a Pickup. I couldn’t tell the difference. My best understanding of it is that you can use Click-N-Ship® to print pre-paid shipping labels and then schedule a pickup. Scheduling a pickup was extremely confusing. The online wizard kept telling me that my address was invalid because I had provided an Indian address while signing up. I tried providing the US hotel address but the error message didn’t go away. Finally I changed my default address to the one in US and deleted my India address to make it work. After spending nearly an hour scratching my head on their website, I arrived at the final screen of the Schedule a Pickup wizard. My options for payment were credit card and PayPal. I first tried PayPal and didn’t succeed because PayPal showed me a message that said USPS only accepted payments from US PayPal accounts. I tried to use my card, but couldn’t give an Indian billing address. I tried with the US address and my bank declined the payment. By the end of this exercise I was pretty frustrated with USPS. So I checked UPS. Pickup terms and conditions were simple. But I could not easily find the rates for pickup. I started the process to schedule a pickup. On the payment screen, I was told to pay an additional $6 for a pickup. On USPS, pickups were free. If I did not want to pay for pickup the only option was to drop off the package at one of the UPS stores. This would not have been possible for the aforementioned reasons. I closed the browser in exasperation. Just then I received an email from B&H saying my RMA was authorised. The good news was that they had included a prepaid shipping label in their email. If I chose to use the prepaid label, the cost of shipping ($11.08) would be deducted from my refund. The fact that they would provide a prepaid shipping label was not mentioned on their website. If I had known before, I would have not spent time on the USPS and UPS website. At least the problem of not being able to pay on USPS was solved. So I went ahead and scheduled a pickup for Thursday US time on the USPS website. My friend left the package at the hotel reception and left for work on her Thursday. USPS was supposed to pick it up from the reception during the day. On Thursday evening US time, I heard from my friend that USPS had not picked up the parcel. I checked the status online and it said pickup was successfully completed. By then I was clueless what to do. Why did the USPS website say that the pickup was complete? How would I get the parcel across to B&H? My friend was checking out and leaving the next morning. I had just my Friday morning to find a solution and I had to do it by evening my time. That is when it struck me. My palm and face met each other. The return label that B&H provided was for FedEx. This was not mentioned either in their mail or their website! In all likelihood, USPS did come for the package, but refused pickup because the prepaid label was for FedEx. At least if the USPS website mentioned that the pickup was refused, I would have understood what was going on. Yes, it was my carelessness that I did not check the return label to see the shipper. It was also silly on my part to assume that the returns could be done by any carrier in spite of having a prepaid shipping label. 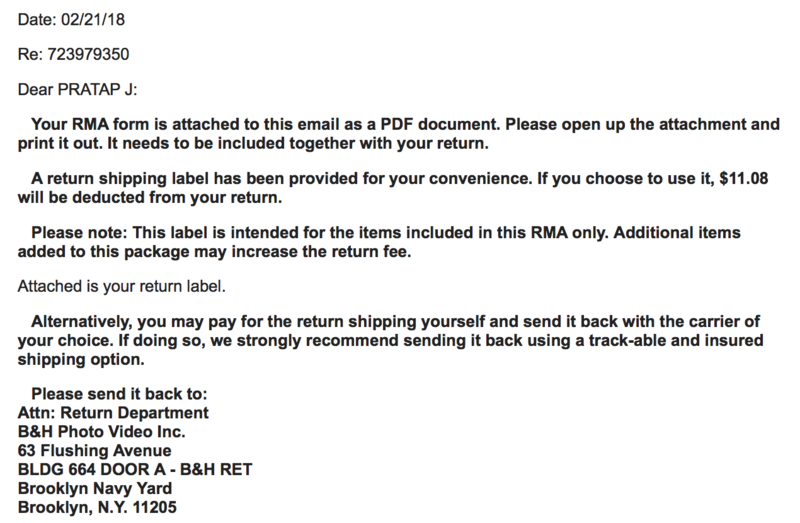 Nevertheless, by stating all details clearly, either on the website or mail, B&H could have saved me a lot of problem. Long story short, my return is on the way to B&H via FedEx. It should reach them on Monday and I should hopefully get my money.